An incredible coconut fish curry that Giorgio Locatelli says is the best he's ever had. Heat the oil in a heavy-bottomed saucepan over a low heat. Add the onions and fry for 15 minutes, or until soft and starting to turn golden. Add the garlic, ginger, ground coriander, garam masala and curry leaves and cook for 1 minute. Add the palm sugar, coconut milk, lime juice and blended tomatoes and cook for 10–15 minutes, or until slightly reduced. Add the salmon and gently poach for 5–6 minutes. 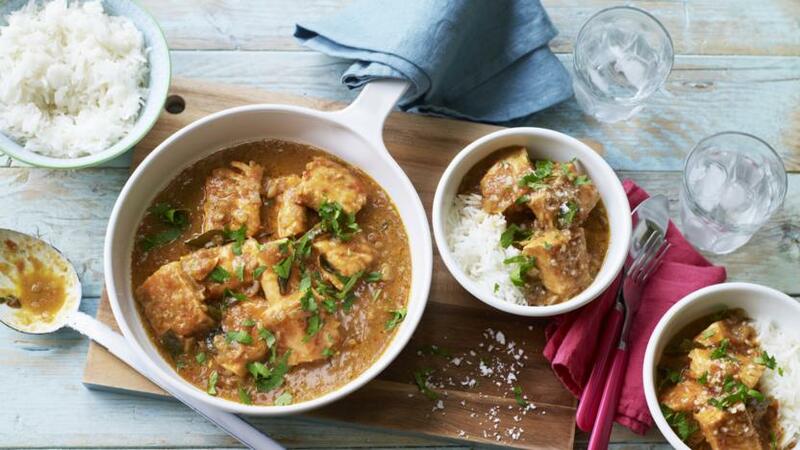 Serve with steamed basmati rice if desired, garnished with coconut cream and fresh coriander.